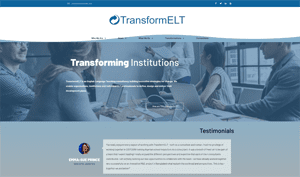 Find out about TransformELT’s Directors, Consulting Committee and amazing array of Consultants. Explore the wide range of projects we’ve been involved in since our launch in 2017 and our approach to transformation. Discover what transformation means to professionals around the world. You can also find out where TransformELT are appearing at conferences around the world, catch up on the latest news, and get in touch if you think we can help you. While you’re here, why not subscribe to our mailing list?